UK alumnus Samson Tarpeh talks about his work as founder and director of Agape National Academy of Music. 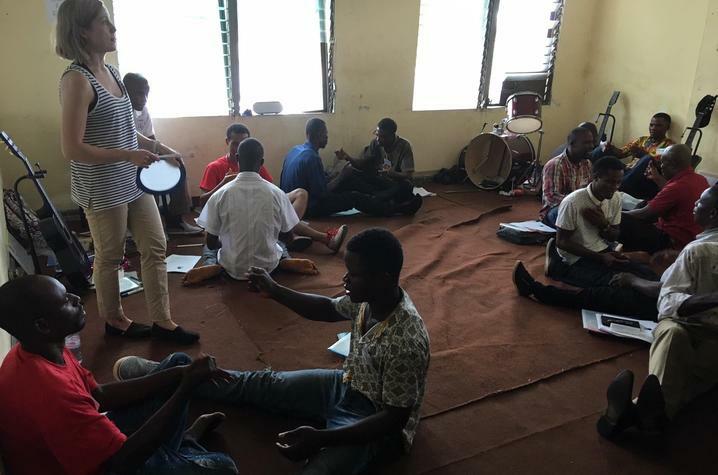 LEXINGTON, Ky. (Dec. 3, 2018) — University of Kentucky Assistant Professor of Music Education Martina Vasil recently traveled to Africa to provide music education techniques and professional development to teachers in Monrovia, Liberia. The trip was in partnership with the Agape National Academy of Music (ANAM). ANAM is an organization that “provides Liberian children opportunities to be successful through music and the arts.” The academy strives to use music education as a vehicle of healing and peacebuilding, for education development, and to enrich the community. Vasil's connection to ANAM began through her work with Samson Tarpeh. Tarpeh is the founder and executive director of ANAM and is a graduate of UK. He completed independent study coursework with Vasil in 2016 in order to develop the music curriculum now used by ANAM. Tarpeh says he believes "the arts, specifically music, is key toward the development of vibrant and heartier communities." 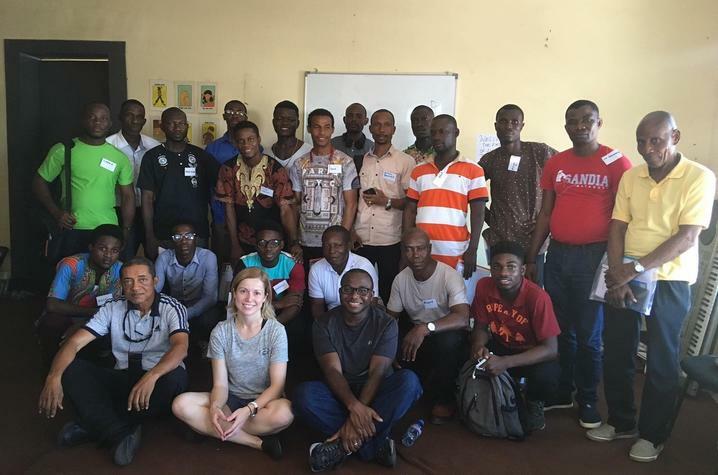 While in Liberia, Vasil had the honor of being the special guest of U.S. Ambassador to Liberia Christine Elder, also a UK alumna. Elder hosted a concert featuring Tarpeh in order to bring awareness to ANAM and its mission. ANAM was established in 2008 with two teachers and 19 students. The organization has helped more than 100 children gain access to music and arts-related education and programming. ANAM aims to bring healing, hope, education and spiritual development to the children of Liberia, many of whom are survivors of the country's civil war. Vasil’s visit was made possible through funding from the College of Fine Arts Faculty Scholarship and Travel Program. 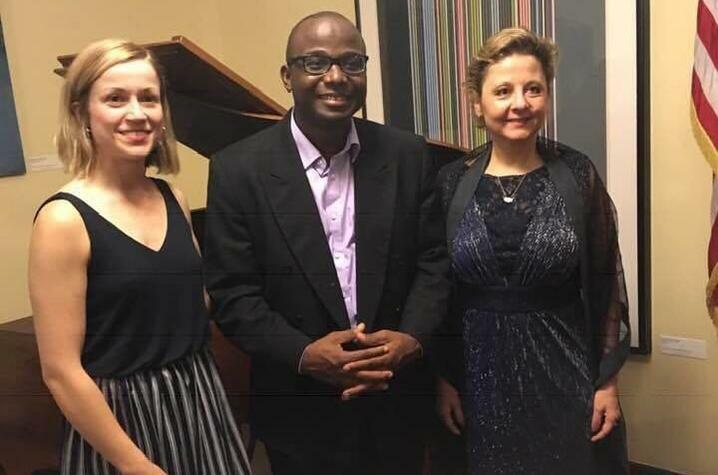 The collaboration assisted Vasil in her research on music education and extends her work with the College of Fine Arts to an international audience. Vasil is the director of the UK School of Music's Music Education Summer Institute at UK, which includes programming in Modern Band, Orff-Schulwerk and Dalcroze methods. She was recently appointed to the board of the Association for Popular Music Education. She is also the director of and a longtime member of the American Orff-Schulwerk Association and serves as president of the Kentucky Orff-Schulwerk Chapter. Currently celebrating its 100th anniversary, the School of Music in the UK College of Fine Arts has garnered national recognition for high-caliber education in opera, choral and instrumental music performance, as well as music education, music therapy, composition, theory and music history.